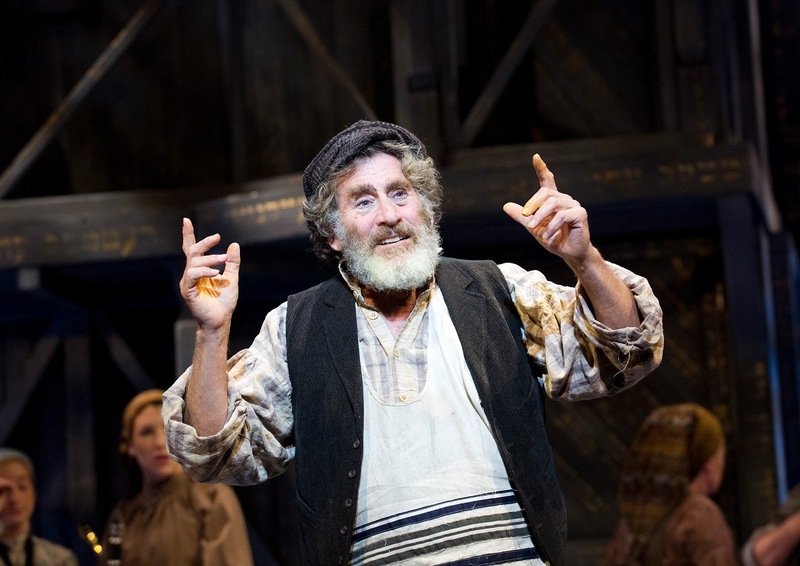 Making his UK stage debut, it’s a treat to see Paul Michael Glaser step up to the challenge of Tevye in Craig Revel Horwood’s take on this classic musical. Some 40 years ago the actor enjoyed global stardom as the Starsky of Starsky & Hutch fame, but to mis-quote Michael Caine, not many people know that around the same time he also enjoyed a supporting role as Perchik in Norman Jewison’s movie of Fiddler. Thus it was almost destined for Glaser to rise to the mantle of the story’s leading man and as a father and husband who has known profound personal tragedy in his life, his performance at times evokes real pathos. When Glaser's Tevye reaches out from the stage to share his deliberations with the audience and we share his monologue debates with God, there are moments of truly wry observation and a shrug so authentic that it symbolises a person familiar with enormous challenge. Not quite the finished product, Glaser occasionally stumbles in word and performance, though these are but bumps that a few performances into the tour will iron out. Revel Horwood again directs a musical that has been set around a cast of actor-musicians. To explain, all the cast are on-stage members of the orchestra and have responsibility for giving life to Jerry Bock's wonderful score. To their credit, this is quite possibly the best actor-muso production to have been seen in some time. As musicians the performers are spot on, no small task given that they are denied the luxury of sheet music that a typical pit-orchestra would enjoy and all play entirely from memory. Bravo to them and to the slick musical direction and orchestration from Sarah Travis that allows them to blend in effortlessly with the staging. Extra special credit to Jennifer Douglas who as the most nimbly gamine Fiddler gives the show a perfect haunting klezmer-esque violin signature. It is easy for a Fiddler On The Roof to slip into cliché and the meerkat-Russian accents that plague the dialogue, though thankfully not the songs, would be best dropped. Together with some of the ridiculously glued on beards, they distract from the otherwise beautifully simple design of the show and at this early stage in the run, these points can be easily addressed. A more permanent irritation is the Hebrew text written on the timbers and the roof tiles of the village buildings. Whilst Anatevka may be fictional, it is not some Disney created fantasy village. It represents a beautiful if at times grim snapshot of a culture destroyed and Diego Pitarch's whimsical lettering cheapens that memory. The supporting cast prove that they can act as well as play a tune. Daniel Bolton’s Fyedka is a beautifully voiced Cossack dancer. Liz Kitchen gives a wonderfully gossipy Yente as well as a touchingly hilarious Grandmother Tzeitel. Jon Trenchard’s Motel is a delightfully plausible and sincere schlemiel whilst Claire Petzal’s Chava broke hearts as she clawed in vain at the rock of her father’s faith in choosing to marry Fyedka. The audience on press night were warm and enthusiastic, laughing in all the right places and even clapping along to To Life. That they laughed however at Golde’s (Karen Mann) raw grief at Chava’s marriage suggests that the structure of that moment needs to be re-examined by Revel Horwood. The choreography, as to be expected from such an expert in movement, is divine. Revel Horwood has reproduced Jerome Robbin’s original Broadway staging and Glaser's Tevye, swaggering in his celebration of life is glorious, whilst the highlight of the Bottle Dance exceeds expectations with sweetly synchronised movement that is as always, breathtaking. Playing at Southampton until September 14, the show tours Britain and Ireland until well into next year. It’s an affectionately crafted production, crammed full of familiar numbers that are sung to perfection and makes for a grand night out.